A filling, satisfying meal for 4. Pre-heat the oven to Gas Mark 4, 350°F/180°C. Cooks the lentils in boiling water until soft, takes about 20 minutes. Drain well. Heat the oil in a large frying pan and fry the onions for 5 minutes. Add the chopped mushrooms and garlic and cook for another couple of minutes. Add the cooked lentils, tomatoes, stock, tomato purée, oregano and paprika and stir thoroughly. Leave to simmer gently for 15 minutes or so. Combine the cornflour with a little milk until smooth (this can be done in a jug). Top up with the remaining milk and stir in some ground black pepper. Transfer to a saucepan and add 4 oz (112 g) of the grated cheese. Heat gently, stirring continuously with a wooden spoon, until it thickens. Bring slowly to the boil and a simmer for another minute. Grease a square or oblong oven-proof dish and put half of the lentil mix into the bottom. Cover with 4 sheets of the lasagne. 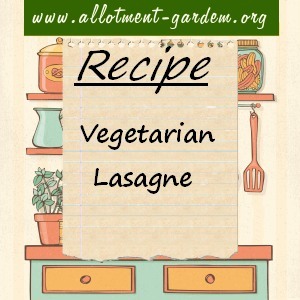 Add the remaining lentil mix and cover with the remaining 4 sheets of lasagne. Sprinkle with parmesan if using. Green lentils are used for as they keep their shape better than red ones. You can replace the mushrooms with other veg that you have available, diced peppers and/or thinly sliced courgettes work well, or have the lot! Freezes well. We divide into 4 square/oblong portions and freeze separately so we have a “ready meal” when pushed for time. Simply re-heat in the micro. Serve with a fresh, green salad.